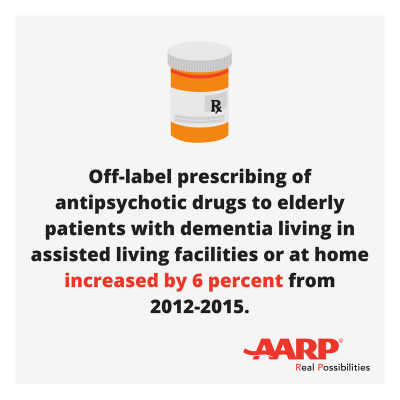 WASHINGTON, DC—While ongoing efforts by the Centers for Medicare & Medicaid Services have helped reduce the risky off-label use of antipsychotic drugs among dementia patients living in nursing homes, the use of these drugs has increased slightly among dementia patients living in the community, according to a new AARP Public Policy Institute report. Using data from OptumLabs Data Warehouse, the report, “Off-Label Antipsychotic Use in Older Adults with Dementia: Not Just a Nursing Home Problem,” found that the share of elderly people with dementia age 65 and older who used antipsychotic drugs while living in assisted living facilities or at home increased by about 6 percent from 12.6 percent in 2012 to 13.4 percent in 2015. Off-label antipsychotic use was highest among certain groups: women, people age 75-plus, and those living in the South. Antipsychotic drugs are FDA-approved for the treatment of four indications: schizophrenia, bipolar disorder, Tourette syndrome, or Huntington’s disease. These drugs include Abilify, Clozaril, Haldol, Risperdal, Seroquel, and Zyprexa, among others. The U.S. Food and Drug Administration requires such drugs to include a black box that warns about an increased risk of death when used in elderly patients who have dementia-related psychosis.